It’s what I call Thai fast food! 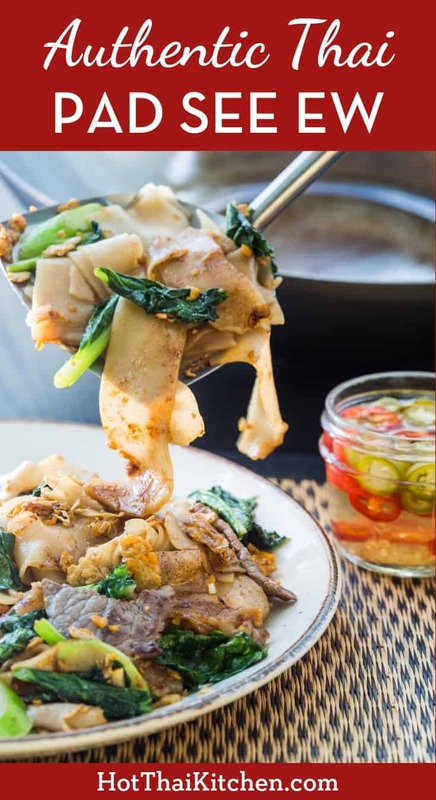 This deliciously chewy pan-fried rice noodles is a popular street food in Thailand, and it’s super easy to whip up at home! Note: I recommend making 1 serving at a time to maximize noodle toasting, so you may want to split the ingredients in half when doing your prep. Stir the meat and soy sauce together well, then add about 2 tsp of oil and stir to coat the meat; this will help the meat separate when you go to cook it. Let the meat sit while you prep other ingredients. Combine all sauce ingredients together and stir to mix well. Heat 1 Tbsp of the vegetable oil in a wok or a large non-stick sauté pan over medium-high heat. When hot, add all of the protein and cook just until done. Remove meat from pan and set aside in a small bowl. If there is meat juices left in the wok, wipe it with a paper towel. From this step onward, I recommend cooking 1 portion at a time for best result: Add 1½ Tbsp vegetable oil and garlic to the wok and sauté over medium high heat until the smallest bits of garlic starts to turn colour. Add egg, break the yolk, let it set just about halfway, then scramble briefly. Add Chinese broccoli and toss to coat it evenly in the oil, about 10–15 seconds. Add 8oz (227g) rice noodles, 2 Tbsp + 1 tsp of the sauce mix, and 2 tsp of sugar. Turn the heat up to high and toss to coat the noodles evenly in the sauce. Once coated, spread the noodles out to cover the entire pan and let them sit without stirring for about 15-30 seconds until some of the noodles have “toasted” i.e. have some charred marks on them (how long this takes depends on how hot your stove gets). Flip the noodles and let them sit again to toast the other side. You may flip the noodles again a couple more times to get more toasting if you wish. Add 1 portion of the cooked protein back into the pan, being careful not to add any meat juices that has accumulated in the bowl, and toss briefly to mix and heat up the protein. Plate the noodles, then quickly wipe the pan clean with paper towel and cook the next serving. Note: Cooking 1 portion at a time is a bit more work, but it is well worth it. If there is too much noodles piled in the wok, it’ll trap a lot of steam, and the moisture will prevent the noodles from toasting and developing that nice “wok char” flavour that is iconic to pad see ew. It might also cause your noodles to be wet and potentially mushy. Each portion only takes a few minutes to cook, so if you’ve got all the ingredients prepped and ready to go, everything will still be hot when everyone is ready to eat! If using tofu, I recommend using fried tofu which is firmer and can hold up in the wok well. You can buy tofu already fried at the Chinese grocery store, or fry your own firm tofu until a golden brown crust forms. If you buy fresh rice noodles from the store and they’re cold, hard and stuck together into a big block, you’ll need to heat them (I do this in the microwave) until they’re hot and softened, and you will be able to separate them then. To make chili vinegar, simple chop up any kind of spicy chilies and let them sit in 5% distilled vinegar for at least 15 minutes before using. Alternatively, you can also blend the chilies and the vinegar together.